Since my last post about the flooding in Alberta, a lot has happened! The flood waters have dropped, exposing a lot of damage. So many people have been left devastated - jobless, homeless or grieving for loved ones. Now people are starting their recovery. Their determination and perseverance are inspiring. So many people have been helping in so many fabulous ways. I have friends who have been volunteering day in and day out since the flood hit - offering evacuees shelter, organizing donations, cleaning, and, soon, rebuilding. I'm so proud of them. Today, he is donating $50,000! Country Singer George Canyon has organized "Team Canyon Clean-up" Crew to help one of the hardest hit communities. The Calgary Stampede is also selling Hell or High Water T-Shirts as a fundraiser, apparently thousands have been purchased. (I bought one! I can't wait for it to arrive!) They even have a Heck or High Water T-Shirt for the kidlets. And, through all this, I found an old university pal too! I saw the video below on Global TV on Tuesday and said: "Hey, a million years ago I went to university with a singer named Blake Reid!" So I googled him! It was the same guy! Cool! Blake Reid was a Canadian Country Music Association Discovery Showcase Artist in 2012 and wrote the following song, Hell or High Water, as a tribute to the flood victims. The song is a free download, but Blake asks on his website that people consider donating to the Canadian Red Cross in return. (This video was compiled by Global TV with some of their recent and poignant news videos of the flooding and aftermath). By comparison, my little contribution is, well, little. 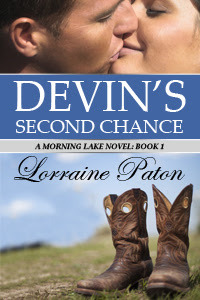 Still, I am pleased to announce Devin's Second Chance, which was released on June 17th, reached over $30 in earnings in June! So, by doubling that total, I'll be adding to my original $100 donation by an additional $66 to the Alberta Flood Fund at the Canadian Red Cross. I'd like to thank everyone who purchased my book in June for helping me make this donation! You are awesome!